After his job is outsourced to Bangalore, ambitious programmer Sandeep Majumdar sets up a remote access in his apartment, tricking his former company into believing that he is really working from India. The film stars the illustrious and magnanimous Deep Roy (Star Trek, Charlie and the Chocolate Factory, Eastbound and Down). Directed & Produced by Derek Frey, written by David Amadio, Gil Damon and Steve Kuzmick. The Ballad of Sandeep is a feature-length comedy based on an award-winning short film released in 2012. Inspiration for the short came from two primary sources: Deep Roy’s desire to show the world his true acting face, and the comedy inherent in the corporate phenomenon of outsourcing. Shot at breakneck speed on a shoestring budget, the short was a labor of love, modest in means but stately in vision. 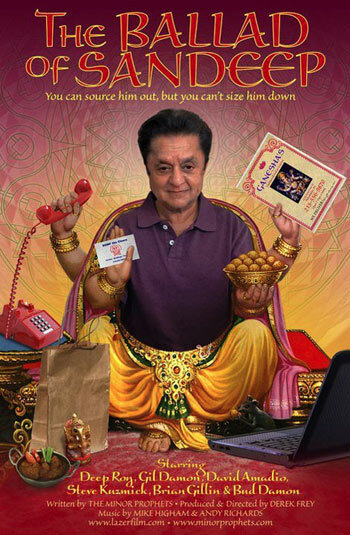 Its absurd take on office civilization, coupled with a dynamic performance by Deep Roy, earned the film over 35 festival appearances and 16 awards—enough to make us look twice at the little film that could. The Ballad of Sandeep is the tragicomic story of computer programmer Sandeep Majumdar: slave, clown, hero.